One of the break outs occurred in the floods of 2011. In these floods 400m of fence was washed away as 300mm of rain fell in the space of a few hours. This was beyond my control. I find it strange that the Department of Conservation and Environment Free State put me in the same category as the Lion breeders in the Free State. Lions kept in overcrowded enclosures are taken to hunting areas where they are shot in the canned Lion industry. Tigers at Tiger Canyons are free ranging Tigers, hunting, mating, denning, marking territories and fighting. It is a fact that no fence can hold two powerful male tigers weighing 220 kg when they are fighting. After the recent breakout, the Department of Conservation and Environment Free State has stipulated that all tigers at Tiger Canyons must wear collars with satellite tracking devices. I have accepted the Departments decision in good faith. It allows us to better keep track of the tigers. 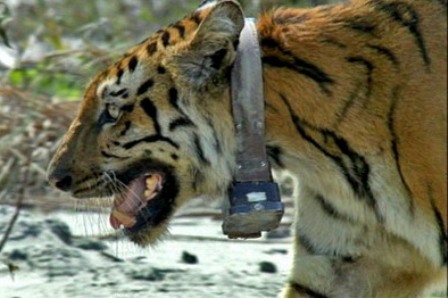 It helps scientists doing research to map the movements of the tigers. In North America, a scientist tracking wolves can off his cell phone, dial in the code of the collar on the wolf. The GPS of the wolf will appear on the screen of the cell phone. This is technology, conservation and research working together at their very best. I hope to get Tiger Canyons up to the same standard. The downside of the Departments decision is this will cost well over a R1 million to implement. I intend to raise the money through the recently formed Tigress Julie Foundation and then approach cell phone companies in South Africa including MTN, CELL C, Virgin, Vodacom and Telkom. The potential mileage for a sponsor to make a television commercial is enormous. If anyone can help put me in contact with potential sponsors, I would greatly appreciate it. I would like to thank Wiempie Geyer and Werner Boing and the Department of Conservation and Environment of the Free State for their understanding and support. The present drought ravaging the Karoo of South Africa, is ruthlessly exposing the farming system in the region. The rain in the Karoo is often isolated thunder showers. The springbuck and other animals follow these thunder showers feeding off the new grass. Once they have grazed the new grass, the springbuck move on, resting the area. The thousands of fences that criss cross the Karoo today, take away the very thing that enabled the area to support millions of animals. It removes their mobility! Today animals are confined by wire fences. They are forced to stay on the land. They cannot move. They trample onto a water points provided by windmills. The land becomes degraded and productivity drops, it is called desertification. Therefore what was once a Garden of Eden under a migratory system, now becomes a desert under a fenced system.